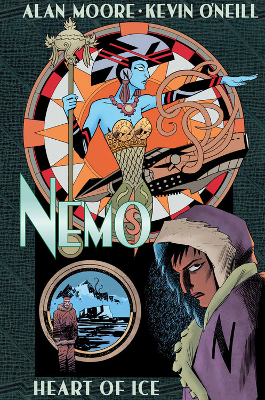 Nemo: Heart of Ice is a graphic novel by Alan Moore with art by Kevin O'Neill and was published in 2013. It's an offshoot of their famous century spanning League of Extraordinary Gentlemen series set in an alternate universe where famous characters drawn from the world of popular fiction are real and co-exist together. This was the first part of the Nemo trilogy. Moore turns his attention here to Lovecraft's At the Mountains of Madness, the classic 1936 chiller about a doomed expedition to the lonely windswept interior of the Antarctic plateau where alien life forms, a lost civilisation, biological engineers and creatures so hideous that one look at them would lead to insanity await. And if you think that's bad I haven't even mentioned the giant penguins. Moore's story takes place in 1925 and revolves around Indian Princess Janni Dakkar (who we last saw in League of Extraordinary Gentlemen: Century 1910). Princess Janni is the daughter of Captain Nemo and has inherited his incredible steampunk submarine Nautilus and loyal pirate crew. But she's already bored of roaming the oceans as a "science pirate" and is searching for some sort of meaning in life. Janni is haunted by the belief that Captain Nemo desperately wanted a son to inherit his legacy and feels as if she was a disappointment to him because of her gender. She decides to do something that her father famously tried and failed to accomplish - explore the uncharted realms of Antarctica. The expedition doesn't get off to the best start though as Janni's last act of piracy involved plundering some goods belonging to the Queen of Kôr (Kôr is a lost civilisation in H Rider Haggard's adventure novels) and the Queen just happens to currently be a guest of the wealthy and powerful Charles Foster Kane (from Orson Welles' Citizen Kane). Kane hires some American adventurers including Tom Swift (an inventor created by Edward Stratemeyer) and "Steam Man" Frank Reade Jr (character who had various forms and was the star of late nineteenth century "dime novels") to track Janni and her crew to the end of the Earth if necessary. The very end of the Earth in this case is Antarctica and neither the crew of the Nautilus or the Americans hunting them down are going to like what they find there. Heart of Ice is an interesting back to basics experiment for Moore and while not as satisfying as the extended League volumes the art by Kevin O'Neill is as superb as ever. O'Neill certainly has fun with the frozen landscapes and unspeakable horrors that the characters encounter. There isn't really enough space here for much plot given the modest length of the book (about 56 pages - but there are two further volumes or the collected edition to buy) and so you don't get the time to settle into the story or get to know the characters very well. The action moves to the Antarctic in no time at all and then essentially becomes a big chase with Janni and her crew trying to keep one step ahead of the Americans out to kill them as they all begin to encounter Lovecraftian weirdness and horror. Moore is sometimes criticised for being too esoteric with these stories and trying to be too clever for his own good with increasingly obscure references to Victorian literature but Heart of Ice finds him presenting a more straight ahead story with far less of the literary and pop culture cameos that have you scrambling for the annotations. There are certainly a few though. Popeye on the first page and Dogtanian the Muskehound during the panels set in Megapatagonia. There are a couple of references to Captain Pugwash too. One of the characters seems to be a descendant of the cabin boy and Moore also riffs on the urban myth about that cartoon containing some crude innuendo. 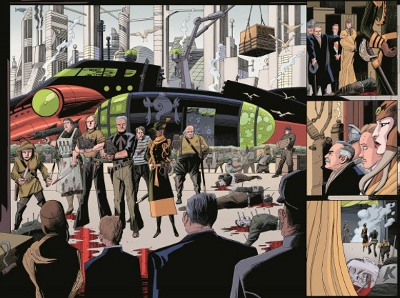 Generally though, the usual "spot the cameo" element to League of Extraordinary Gentlemen is very restrained here. There is a bit of Poe and Jules Verne thrown in and the anachronistic steampunk vehicles and technology used by the characters are a lot of fun. Given the more stripped down nature of the story and the relative absence of Alan Moore "easter eggs" to decipher, Heart of Ice is as much a showcase for artist Kevin O'Neill as it is for Moore and his Antarctic panels are wonderfully atmospheric and detailed in his usual pulp fashion. There are a higher than usual number of splash pages here with many huge illustrations that spread out beyond a single page. One of Janni and her crew in a stand-off with Kane's men at the start, the imposing neon hued Nautilus and a futuristic New York skyline behind them. The psychedelic Megapatagonia of the Blazing World and then the mountains, caverns, and subterranean ruins of Lovecraft's Antarctica. The Antarctic panels take place in dim or strange light and are all the more spooky for this approach. The reveal of the Mountains of Madness is one of the highlights of the book. Big craggy jagged tree like mountains that spiral into a red sky. There is a great panel early on too of the Nautilus docked at its Antarctic base with little huts and cabins and wonderfully illustrated snow capped mountains in the background. 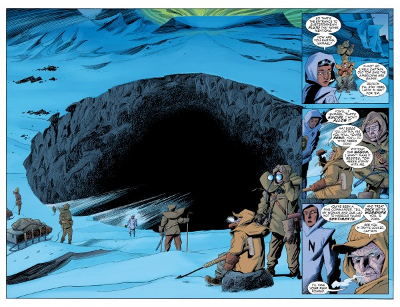 Heart of Ice is sort of like a horror version of Tintin in Tibet at times. It has that same strange wilderness atmosphere. Many of the creatures they encounter are rather astral and ghostlike and this generates some spectacular art. Look out for an appearance by the shape shifting alien from John Carpenter's The Thing too. Perhaps the best sequence in the book occurs when Janni and her team are trapped in fragmented time and events run out of sequence and loop back in on themselves as various horrors descend. It's very nicely done and of course quite creepy. Weaknesses of Heart of Ice? Well, as previously mentioned, the book's modest amount of pages to tell a complete story is constrictive and so characterisation is not as strong as it has been in previous books in this series. I don't think we really get to know Janni Dakkar as well as we'd like to here as she spends most of the book running away from monsters. An early scene where she is brooding in the Nautilus and reflects on how heavy her father's coat is to wear is the sort of thing I'd have liked a bit more of - especially as Janni was an intriguing character in Century 1910 who you wanted to know more about. The American villains on Janni's trail are a trifle dull and I struggled to remember who was who or tell them apart sometimes. I suppose it was much easier to remember who was who in The Black Dossier in terms of chasing villains because the League were being chased by James Bond, Bulldog Drummond and Emma Peel. Moore's public domain American characters here are rather obscure in comparison. However, Nemo: Heart of Ice is still definitely worth buying if you are a fan of this series and the complex and intricate alternate universe it has created. The hardcover solo edition is beautifully designed and presented with splash pages at the front and back and some enjoyable art deco adverts for fictional 1920s ocean liners before the story begins.